I love the early mornings at TLC. I normally get there at about 8.30am, and I love the sound of the key entering the lock, opening up the cafe, turning on the lights and, in the silence, imagining who and what is going to fill that silence as the day progresses. It’s often freezing cold in the cafe, but it doesn’t take long once the heaters are on, the urn is switched on, coffee machine is brewing its first pot, and the pastries are warming in the oven, for the TLC day to really begin. Thursday’s shift is covered by two octogenarians; both great grandmas, British, expert bakers and and both with huge hearts. They met at TLC; one is a long-standing family friend of ours, and the other was a previous neighbour of mine. Now, the former picks up the latter and together they arrive at TLC ready for a hard day’s work, sharing a fabulous camaraderie and growing friendship. This week, they were joined by a young African woman to complete the TLC team. She has been here for a few years, is still in the asylum process, speaks fabulous English, is a keen sports player, and loves mind puzzles. Sometimes when it’s quiet, the three of them will pore over a sudoku or crossword challenge. We have lots of regulars, who visit us most days and most weeks. Other regulars are new to us but within a few minutes it’s as if they are also part of the fabric of TLC. One such new regular is a young man who approached me after a couple of weeks, and said, “I’ve been thinking about what it is that I can give in return for the cafe experience I have here. How about some art classes?” So this week, on Wednesday, Doodle Club began. He arrived and set up a table with inspiring art books, colouring pens, pencils, and sketchpads. 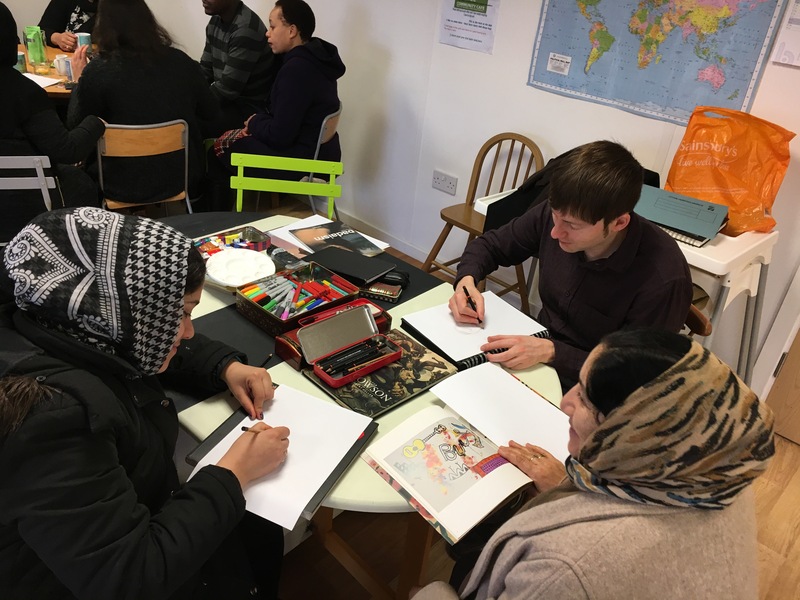 Over the course of the morning, people gravitated towards the table, and the delight on some of their faces in participating in this activity was very evident. When we rely so much on language for communication and a sense of belonging, to have an activity where there is another means to feel part of something was truly amazing. The two ladies in the picture are Afghani and have very limited English. They too are ‘new regulars’, and when they were at the doodle club it was the most relaxed I have seen them in a cafe.